"Mitt Romney", "capital gains", "carried interest", "tax policy"
We have had some discussion before on the preferential federal tax treatment for "capital gains" income, i.e. money made from wealth rather than from work. But I have had a few requests to elaborate and put together an educational post on the subject. This is my attempt to do so. Capital gain and carried interest are intricately related concepts, the former is essential to understanding the latter, and together form the basis for the extraordinarily low tax rates for extraordinarily wealthy Americans. Capital gain is also the easier concept to understand. So let's begin with that. It's the economist's fancy term for money made from investments - stock, bonds, real estate, etc. The "capital" is the amount of money you invest, and the 'gain' is the money you make on top of your original investment. 10 shares x $10 per share = $100. $150 - $100 = $50. You can call 'capital gain' essentially income from wealth. This $50 is undoubtedly your income, and you must pay taxes on it. How capital gain income is taxed: Even though it's income, the federal government usually doesn't tax it as ordinary income, i.e. income from work. First of all, there are no payroll taxes on capital gains income, nor do you earn social security credits for having capital gains income. It's even worse considering that in a self-employment situation (which this would be, if you are just trading stocks), the payroll tax is doubled and is known as the self employment tax, since the self-employed must pay the payroll taxes for both the employee and employer sides. Under ordinary circumstances, that is a 6-12 percentage point gap. It is however taxes as income, just not the same as income from work. If you cash in your investment before one year, it is taxed as ordinary income, however, money made on investments held more than a year are taxed, even under the income tax code, at a much lower rate. Here is the table on how the federal tax code treats capital gains income as opposed to income from work. Focus on the Long-term Capital Gains Tax Rates. The numbers from 2013 simply reflect the end of the Bush tax cuts. As you can see, income from wealth ("long term" capital gains) is taxed at half the rate or less than income from work. And that is on top of the break capital gains incomes are given from the payroll tax. Bottom line: the government lets rich people making money from investments keep a lot more of their income from wealth than it lets us working stiffs keep of our income from work. For example, if you are a single person making $30,000 in taxable income a year from working, you pay a total of 15% in federal income tax plus 6% (now 4% thanks to the Obama payroll tax relief). Your total federal tax burden is about 20%. If you are single and self employed pulling in $50,000 in taxable income a year, you are at the 25% tax bracket and including the payroll tax, paying about 30% on federal taxes. If, however, you are a wealthy investor without the need to work and making $3 million in taxable income a year from your investment income, you pay a cool 15% in federal taxes. The leveling off after about $102,000 in income is due to the fact that while the income tax rates on those earners continue to increase as they earn more, payroll taxes stop being deducted. But the precipitous drop at the very top of the income ladder is purely the result of preferential tax treatment of income from wealth. Notice how close their effective tax rate is (16.6%) to the actual top rate of the capital gains tax, which is a flat 15%. These are also among the least productive members of our society. For example, a neurosurgeon earning $10 million a year pays a top income tax rate of 35%, but a hedge fund manager making $10 million a year pays a measely 15%. Which one of them works harder for their money and which one gets a preferential tax treatment? Give you a hint, it's not the same guy. Wait a second, you say. How can a Hedge Fund manager making $10 million a year get away with paying only 15%? Welcome to the world of "carried interest" - a way for people in the wealth management world to avoid federal income taxes. So what is carried interest? Carried interest is the the percentage of profits a hedge fund or private equity fund manager is paid when the investments they manage make money. Let's say a hedge fund manager gets a 25% commission on the gains of a fund he or she manages. Let's also say he manages $100 million in investments (this is small potatoes for most hedge funds, but this is just an example). Now let's assume that the fund makes a 20% return, i.e. $20 million in a certain year. So the manager makes a cool $5 million. His federal tax on this? 15%. Why? Because the income is made from wealth - invested money - all income from it, whether going to shareholders or to the fund manager, is treated like capital gain. Thus even though the fund manager is essentially collecting a salary and bonuses, their tax rate is the same as the capital gains rate. This, my friends, is how Mitt Romney only pays 13.9% in taxes. You see, Romney negotiated a retirement agreement from his vulture company Bain Capital in which he is essentially entitled to a portion of Bain's profits. Since Bain is essentially a fund managing/holding company that makes profits buying and selling other companies, its income is considered capital gains (and thus taxed at the capital gains rate as opposed to the present day corporate income tax rate - yet another way big financial companies benefit from low taxes while companies that actually make things have to pay more). 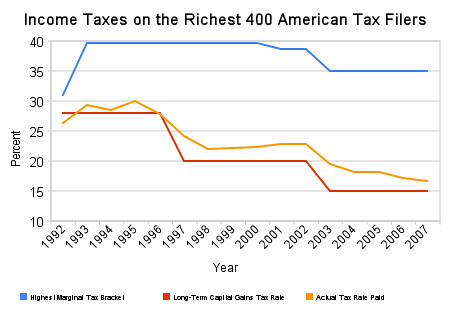 Romney's portion of it is also considered capital gains and hence taxed at the low rate of 15%. As you can see, the capital gains rate is reserved not only for people who make their money from investments but also to rich former and current fund managers who get sweetheart deals from their employers for putting people out of a job that also allows them to pay the low rate. For you though? No, that's not available. Get a job! There is class warfare going on in this country, but it's not the President attacking the wealthy class. It is the uber wealthy attacking the middle class and winning. Our tax code is ridden with giveaways to the rich, to multinational corporations and to industries of yesterday (oil, for example). See, in tax lingo, the money you make from working is "ordinary income" - you know, for ordinary schmucks like you. But the money the rich make from their existing wealth or even from managing other people's wealth is "capital gain" - sounds like the savior of capitalism, doesn't it? Actually though, it is the money you make from work - and the fact that you work and produce - that makes capitalism work. In a fair market economy, there is absolutely no reason - moral or economical - to treat your income - earned income - worse than unearned income. The Republicans might like talking about how our social safety nets like the unemployment insurance program "pay people not to work," but the truth is that our tax code pays the super rich not to work. And to hear the Republicans, they would make the capital gains rate zero, meaning that money made from wealth would not be taxed at all and the burden transferred even more to money made from work, that is, you. Even if capital gains can be justified in order to encourage small business investments - although a much better way would be to treat all income the same and bring down the overall rates, and then let investments flow based on the merit of a given product and not the merit of the tax code (we do, after all, want a free market, don't we?) - there is no reason whatsoever to allow it for huge investments that has less to do with productive business investment and more to do with pumping the pockets of those who already have aplenty. There is class warfare. The Capital Gains rate and "carried interest" are two of the most effective weapons the advocates of modern day feudalism use against you.